This article will discuss service writing in a race and large event venue. The use of repair tickets for both MTB and road events will be reviewed. The repair tickets discussed here were developed and used by the US Team Mechanics at various World Championships. The nature of services provided by race mechanics varies somewhat from traditional retail mechanics. However, both retail and race service departments need to correctly diagnosis and record the customers’ (athlete or participant) service needs. During service work with numerous customers, it is useful and even critical to track and record the required services. Events such as neutral support, large club or team events, and charity rides lend themselves to the efficiencies of service writing. Numerous customers often wait for service at these events, and having a system to channel these people makes the service experience more pleasant for everyone. 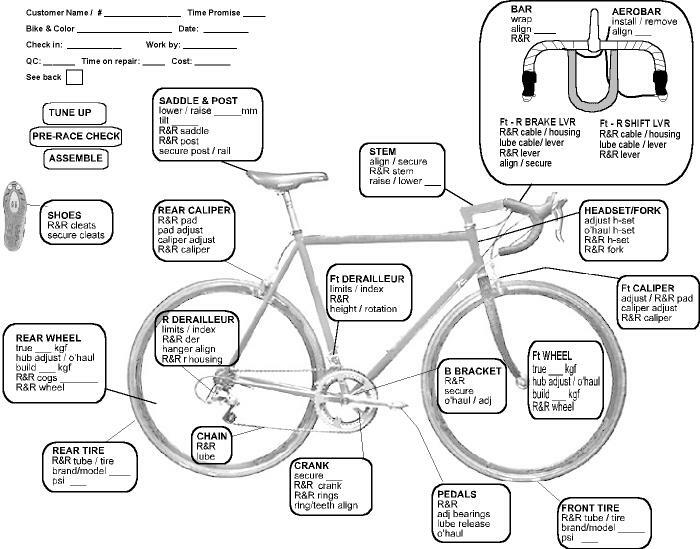 The team mechanic servicing a limited number of bikes can also benefit from recording and documenting service. The most critical skill in service writing is communication. The Service Writer must be able to listen to the customer, reflect back their concerns, ask probing questions regarding symptoms, and then record this on the repair ticket for the mechanic. The Service Writer walks a line between finding out all the relevant information, and “simply looking for problems” where none existed. The mechanics’ staff must get the bike is racing form, but generally the mechanics are not looking for additional work that does not help the customer either finish the event or go faster. The classic mistake of any service department is allowing the customer to diagnose the repair. Some customers may of course be very knowledgeable regarding their machine, and may actually be correct in their diagnosis. However, it is important that the Service Writer reviews the symptoms with the customer and then draws his/her own opinion, even if it ends up being the same as the customer’s. For example, a customer comes in stating, “Tighten the crank arms, please”. The mechanic then tightens the arms as instructed, but the customer returns complaining, “This thing still creaks, I told you to tighten the arms!” What the customer really wanted was for a creaking noise to go away. Loose crank bolts are a common cause of this noise, but certainly not the only cause. What was missed in the service writing was the symptoms, “Creaking in drive train”. The Service Writer may then write the work as “secure crank”, but should also note “Creaking in drive train”. A mechanic given this symptom will check crank security, but he/she might also look at the pedals, chainrings, bottom bracket, and well as other issues. It is recommended the service department use only one Service Writer who is taking in bikes, recording symptoms, and writing service. While it is important each mechanic be knowledgeable in service writing, it is likely there will be some mechanics that are more skilled and experienced at this than others. The position of Service Writer role may change between mechanic’s staff, but by using one person to check in bikes and Service Writer allows the other mechanics to concentrate on the actual work. The Service Writer may also act as “triage nurse”, assigning priority to the repair and allotting work to the various mechanics. By using this specialization of labor, the service department can service a greater number of customers. Of course, there will be extremely busy times where it will be necessary to have multiple service writers. There are four repair tickets available here for downloading as Adobe Acrobat PDF file. Two documents are for MTB type racing, and two are for road racing. There is a pair of picture based repair tickets, relying more on a image of a bike, and there are a pair of word based repair tickets, relying only on written descriptions on service. Print off each type and then decide which one is better suited for your style. The image-based tickets are for 8 1/2 x 11 inch paper, and the word-based tickets are 8 1/2 x 14 inch paper. Service writing with any system requires practice to quickly find the appropriate repair, as there are approximately 100 repair options on the ticket. The mechanic will also need to become familiar with the system. The word-based tickets use a check-off boxes and description circling. There are over 100 possible boxes to mark on each ticket. This style of ticket has more potential for detail than the Image-based ticket. However, this style of ticket requires relatively more practice for the Service Writer and mechanic to become efficient. 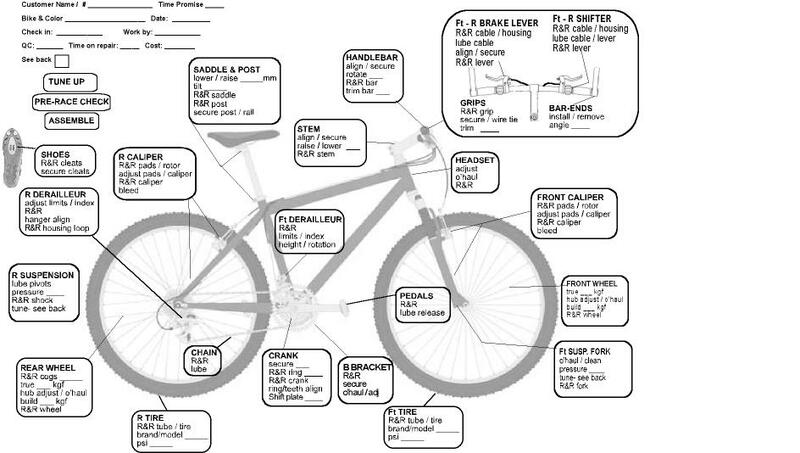 The image-based tickets use an image of a bicycle with boxes by each component or component area. The required item is circled, preferably in brightly colored ink. The mechanic may then quickly scan the image for notes and circles, and then and perform the work as outlined by the Service Writer. Greater detail on rider symptoms can be written adjacent to the box or on the back of the form as needed. Always note if there is additional information on the back of the ticket. It can also help the mechanic to check off the item after completing that task, using different colored ink. Each ticket has room for administrative information. This is important information and should not be ignored. This information can be especially important when a customer returns with problems that were serviced by the staff. Name / race # :_________ – Record in this area the customer’s name and race/plate number if known or applicable. Time Promised: _________- Note for the mechanic if this bike is required in a timely manner. This may simply be ASAP, or 2:00 PM due to a 3:00 event start. Bike and Color:_________ – Beside riders name and number, having the bike brand and color speeds finding the bike for the mechanic before and after work. Date: _______ – Record date of work. This is especially important for multiple day events. Service Writer: ______ – The Service Writer should legibly initial the ticket. QC: ______ – If there is a Quality Control inspection on the service, note the inspecting mechanic and the result. Time Spent: _____ – Some programs may want to record the amount of time the mechanic spent. Cost: _____ – Some programs will charge for parts, labor, or both. This line can be either cost to the program or cost to the customer. There is some shorthand that is used on the tickets. “R&R” is used often and means “Remove and Replace”. In other words, the item is simply removed and a new one is installed. “Ft” is “front”, and “R” is “rear”. For example, “Ft-R shifter” accounts for both front and rear shifters. The Service Writer will circle the appropriate lever as necessary, and then circle the work as “R&R cable /housing, lube cable / lever, or R&R lever”. Note also are situations where it is useful to record measurements. For example, if bars are shortened, the Service Writer should note the amount to be cut. There is a blank line for many of these measurements. Generally, assume all measurements to be in millimeters unless noted by the Service Writer. For other services the pressure, torque and tension may also be recorded. For complete wheel builds it is especially useful to record final spoke tension. The image-based repair tickets use a separate image box for more detail in the cockpit area. Brake lever, grips and shifter work is recorded here. The suspension areas also use separate box. The service options are simple and limited. Use the back of the sheet for detailed suspension service notes as necessary. There is often a level on chaos and tension at race events. Having documentation and a service check-in procedure can help maintain a sense of order and calm for everyone. By recording and documenting the service, a race mechanic will be able to review the work after the event. This will help the mechanic get a better sense of what tools, parts, and supplies to stock. Common repairs will become quickly apparent, and weakness in service department can be tracked. After reviewing and practicing with these repair tickets, please feel free to contact me with feedback.